Love these donuts! They make you feel heavy though & give you a sugar crash! Good for parties & snacks but I’d half them one while donut is too much sugar! These donuts are deliciously naughty with their yummy pink icing. They taste so decadent but the whole family loves them and they do not last long! Woolworths pink iced donuts are a nice soft donut that is special treat once on a while.They are always fresh and delicious and lovely for a morning break. Doughnuts are a sweet and relatively inexpensive sweet treat and they have a welcome and wonderful colour and flavour. Perfect for a morning tea treat. These are actually pretty good. At a reasonable price point I pick these up every now and then as s naughty treat. Pink is my fave! These delicious donuts have a different texture and flavour to the traditional donuts..they have a much lighter and cakier texture. They are larger in size to regular donuts and are much more like the franchise brand of donut. They come in a pk of 4 and normally sell for $5.00 but at present are on special for $3.00. So keep your eyes peeled as you can always pick these up on special from time to time. They are simply glorious for a special breakfast or morning or afternoon tea and make a perfect treat for PINK RIBBON events. 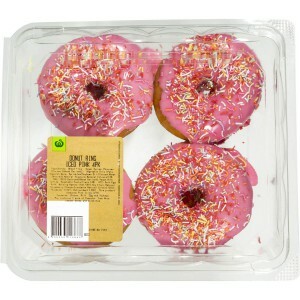 How would you rate Wooworths Pink Iced Donut rings 4pk?